Dotster Review 2019: Is Dotster a Good Hosting? Dotster is one of the first American web hosting company. Not only does Dotster provide a variety of products and pricing plans, customers can also take advantage of their business solutions and web design services for tailored uses. onClick="trackClickout('event', 'clickout', 'Vendor Page - Visit User Reviews', 'Dotster', this, true);"
I know I have been using them as a domain registration company for many years. They have been bought out by EIG who seems to be buying out all the hosting companies I have ever used, operating them under their original names. I never new they offered hosting until I received a month free hosting from them. Justhost/Ehost also owned by EIG just deleted/lost/misfiled my website. I read EIG is moving infrastructure to India. My opinion right now is good. Dotster has been around since 1999 and started as a domain registrar. In the early 2000s, Dotster switched over to web hosting and later the company was acquired by the industry giant, EIG. 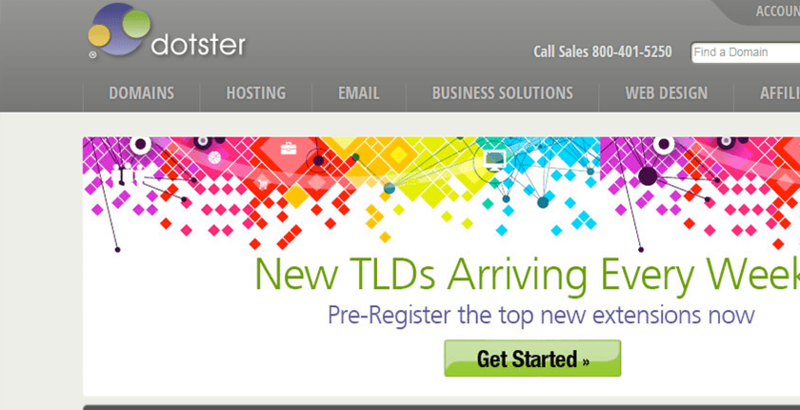 At the moment, there are around 160,000 domains active on Dotster which is a healthy customer base. This U.S.-based hosting provider is only available in English but supports domains from almost any country. Register, transfer, or renew your domain. Web analytics tools to monitor the performance of your sites and user behavior. An email provider with spam filtering, security, and webmail check-in. Website design services: You can hire an expert on the Dotster platform to design and build your website for you. A drag and drop site builder: Dotster provides their own basic website builder. It’s not great, but it’s easy to use and gets the job done for simple sites. Free applications: You can also use free applications like WordPress, Drupal, or Joomla to build and manage your site. vDeck is the hosting manager unless you have VPS hosting. It’s not the best, and I prefer working with other options, like cPanel. However, it’s a pretty straightforward interface that’s simple to navigate and use. You can manage all your databases, FTP transactions, and emails from the single dashboard. The signup process consists of three steps: Register your domain, confirm your selection, and add your billing info. You can get Linux, Windows, or VPS hosting on Doster with Linux being the cheapest and VPS hosting the most expensive. There are three available pricing plans on Linux and Windows: Basic, Deluxe, and Ultra. A huge benefit of their pricing plans is that you get unlimited subdomains and storage space with all three as well as highly scalable bandwidth. For the Deluxe and Ultra plans, you also get unlimited domains. With Ultra, your number of emails, FTP logins, and databases are also unlimited. Other than that, you get all the features on all pricing plans. They will offer you many extras after signup, such as managed WordPress, extra domains, etc. Plans are available on one, two, or three-year terms and the longer term you choose, the more you will save. There are no free plans, however, they do offer a 30-day refund period. Dotster does have an extensive documentation site where you can explore to solve issues. Some articles are a bit out-of-date. However, their chat support is quick to respond to queries and don’t have those annoying automatic responses. I got a reply to a presale question in about 10 seconds and to a support query in just a few seconds longer. Overall Dotster is a solid hosting provider with access to all the essentials without really offering anything spectacular. If you want to host a simple site at an affordable rate without having to worry about storage limitations, Dotster might be for you. Use managed WordPress or other CMSs build your website. Free built-in drag-and-drop page builder. Unlimited storage space with all pricing plans. Flexible pricing plans with your choice of infrastructure. There is a lot of upselling, particularly when you sign up. vDeck is not the best hosting manager for everyone. Wondering how Dotster stacks up against other Web Hosting companies? Enter any other Web Hosting company and we will give you a side-by-side comparison.